Padraig Harrington. Pic by PA.
Ryder Cup captain Padraig Harrington insists his recovery from injury is “ahead of expectations”, despite admitting it could be several months before his wrist is 100 per cent. Harrington is back in action for the first time since November at the Maybank Championship, starting on Thursday in Malaysia, hoping for some “good karma” in what was traditionally his season-opener. “I wouldn’t say the wrist is 100 per cent, it might not be for about nine months, or at least another six or seven months. 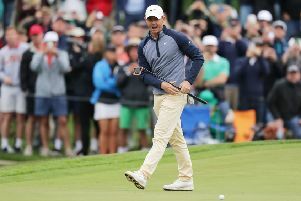 I’m working away at it,” the three-time Major winner said. “Traditionally the Malaysian Open was my first event of the season, if you go back 20 years, so it’s my first event this year and I’m looking forward to that good karma, let’s say. “It’s interesting to come out here. I hit shots on the range here, I hit shots last week and the wrist is holding up, there’s no doubt about it.